For the past few months, I have been giving googly eyes to my grocer’s freezer. Why? Well…other than my love of ice cream and all things frozen, I had come across a brand called Arctic Zero . What makes Arctic Zero so…interesting? Well, for those of you who may never have run across these pints, these ice creams contain less than 150 calories in the ENTIRE pint of ice cream. Which means, indulging doesn’t feel as guilt-ridden and laden with sin, right? Of course. Also is the fact that all of their flavors are gluten-free, fat-free and suitable for the lactose intolerant. Loving this even more. You also won’t find chemicals in these pints, for they are made with only organic and natural ingredients. An entire pint provides 8 grams of fiber as well. Oh…and these have no sugar alcohols in them, so they are suitable for children and adults. And to top it all off…kosher and non-GMO! But what about first bite? That was what I was going to figure out. The difficult part was deciding which one to start with. But, finally, I decided to go with two of my most favorite things in the world: chocolate and peanut butter. The Arctic Zero Chocolate Peanut Butter Frozen Dessert is not going to be the rich and creamy ice cream that you find in stores. In fact, it’s definitely more like a sorbet in texture. So, if you are going into this expecting rich, creamy goodness…look for regular ice cream. But…if you’re okay with sorbet, and I am…this is really really good. 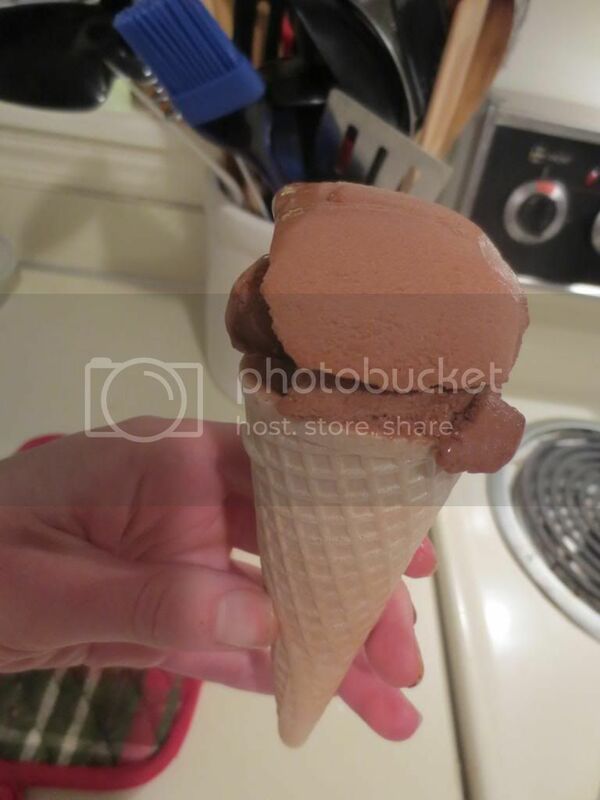 I wasn’t actually expecting the sorbet texture, so when I was trying to scoop it into a gluten-free ice cream cone, I was a little bit surprised, but everything frozen goes good in an ice cream cone! I got my roomie situated with hers first and I was dishing up my own dessert, I saw her giving hers a taste. I asked how it was…and she liked it. I settled in with my own gluten-free ice cream cone and took my own taste. Chocolate. That’s what hit me first. And that’s what hit me most. In fact, I can barely make out the traces of peanut butter flavor in this, which is disappointing because I LOVE peanut butter. I was expecting something that would taste like an amazing peanut butter cup. The frozen dessert itself is definitely good. But…you might as well just call it chocolate because the peanut butter is really hard to find in the flavors. Other than that…this was highly impressive on the frozen treat standards. It wasn’t too rich. It wasn’t filling either. And, with a serving only dishing up just over 30 calories (for 1/2 cup), you can’t argue that this is a guilt-free treat indeed. And it does have great taste. Just wish the peanut butter was more in the forefront of the flavor on this one. I also highly recommend that you let the pint sit out on the counter for at least 15 minutes to let it thaw out some. Otherwise it is really difficult to scoop. Letting it soften up a bit worked very well and I did this just out of being a lactose-free ice cream freak and knowing that they usually have to sit out in order to be able to scoop them. No big deal. It thawed a bit while I ate dinner. And by the time dishes were done, it was ready to be put in the gluten-free ice cream cone. Delicious!! Let’s talk ingredients! 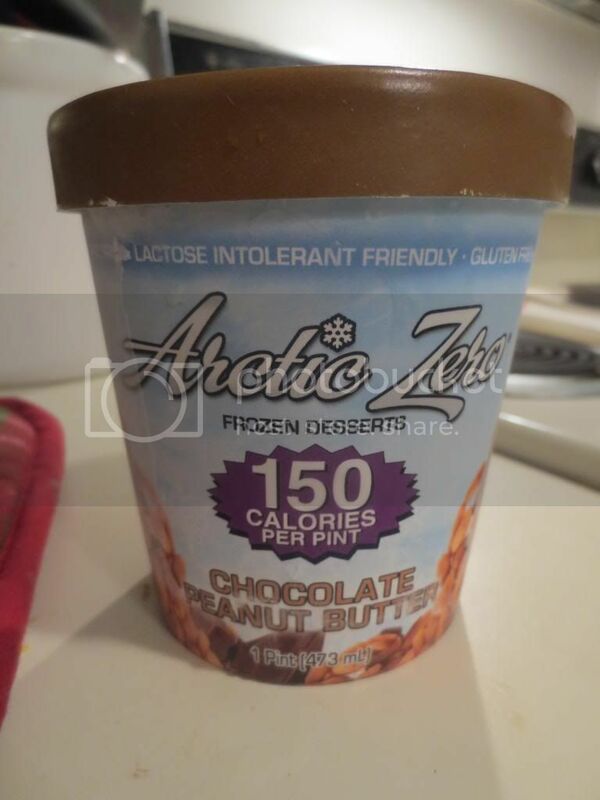 All of the chocolate based ones, like the Chocolate Peanut Butter Frozen Dessert, from Arctic Zero are composed of purified water, whey protein concentrate, organic cane sugar, chicory root, dutch processed cocoa powder with alkali, guar gum, xanthan gum, natural flavors, sea salt, and monk fruit concentrate. This one also includes the addition of peanut butter! Nutritionally speaking, a 1/2 cup serving of Arctic Zero Chocolate Peanut Butter Frozen Dessert will provide you with 37 calories and 0 grams of fat. Yep. Fat-free! Each serving only contains 80 mg of sodium, 2 grams of fiber, and 3.4 grams of protein. So, you really don’t feel too guilty if you end up sitting down and indulging in the entire pint. We showed restraint and kept it to a serving (or less) as I was filling up gluten-free ice cream cones. I’m impressed with Arctic Zero. These were much better than I anticipated. Which is good…because I have two additional flavors in my freezer already. I think the only fault I find with the Chocolate Peanut Butter flavor is that the peanut butter flavor almost seemed lost in the rest of it. It was there…but just a hint of it every now and again. But I’m looking forward to seeing how the Mint Chocolate Cookie and Cookies and Cream stack up! TOTAL WOW. TOTAL YUM! ZERO GUILT! This entry was posted in Chocolate, Dessert, Food, Frozen, Gluten-Free, Ice Cream, Products, Review, Snacks, Sweet Stuff, Vegetarian by The Celiathlete. Bookmark the permalink.